The eclectic sensibility of Percy Wyndham Lewis equipped him perfectly for his role as the gadfly of the English avant-garde. It was the avowed mission of this painter, writer, publisher and propagandist to radicalise society through art, to 'blow away dead ideas and worn out notions'. Lewis's explosive rhetoric was often only that, but he managed to found the most important British response to European modernism in a movement he named vorticism. 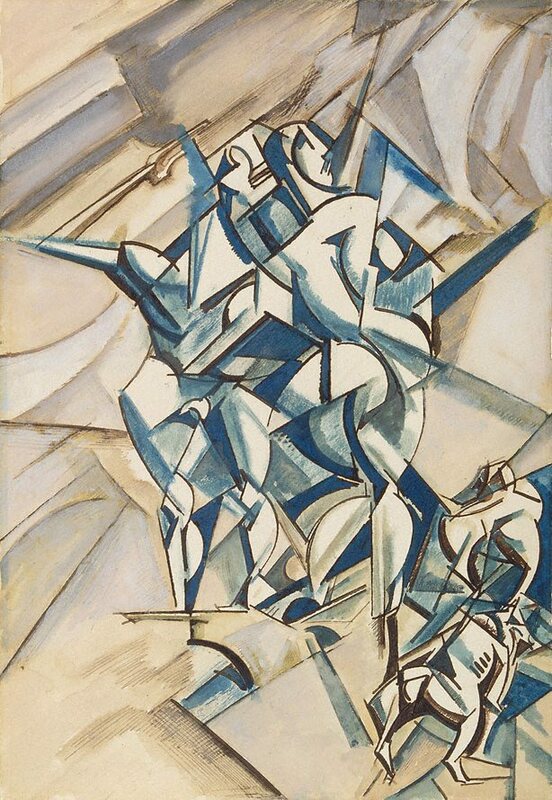 Launched with his 1914 periodical 'Blast', vorticism synthesised the cubist and futurist techniques Lewis had been experimenting with previously. This image from 1912 is already precociously vorticist. The essential steeliness of the style is clear. Jagged lines, sharp angles and metallic colours - an overall effect of shattering - comprise its outward features. The transformation of the figures occasioned by this treatment is brutalising and mechanistic. Lewis was none too gentle in his appraisal of human worth. Here, the bulldogs demonstrate more character than their owners. Michael Tachmindji, circa 1956-circa 1974, United Kingdom, Tate catalogue  as lent by Michael Tachmindji. Arts Council catalogue  as lent by Michael Tachmindji. Anthony d'Offay Gallery, pre 23 Sep 1983, London/England, Purchased by the AGNSW from Anthony d'Offay Gallery 1983. Purchased from the exhibition 'Wyndham Lewis Drawings and Watercolours 1910-1920', 13 April - 14 May 1983. Renée Free, Art Gallery of New South Wales handbook , 'European', pg. 36-56, Sydney, 1988, 56 (illus.). Renée Free, AGNSW Collections , 'The Western Heritage, Renaissance to Twentieth Century', pg. 108-172, Sydney, 1994, 146 (colour illus.). Renee Free, Art and Australia , 'European Acquisitions: 1972-83', pg. 63-67, Sydney, Spring 1984, cover (colour illus. ), 66. Bruce James, Art Gallery of New South Wales handbook , 'Western Collection: Works on Paper', pg. 78-92, Sydney, 1999, 89 (colour illus.). From caves to canvas: an introduction to western art , 'Man, Machines and Movement: Futurism and its followers', pg.225-231, Sydney, 1992, 229 (colour illus.). Modern Britain 1900-1960 , Melbourne, 2007, 68 (colour illus.). From caves to canvas: an introduction to western art (Second edition) , 'Man, Machines and Movement: Futurism, Rayonnism, Skyscrapers', pg.251-266, Sydney, 1998, 225 (colour illus. ), 256.